Inverdoorn is a Western Cape Game Reserve offering a Cape Town safari experience only 2.5 hours from the city. Inverdoorn Game Reserve is only a 2.5 hour drive from Cape Town and situated near Ceres in the beautiful landscape of the Karoo in the Western Cape of South Africa. Green grass, thorny bushes, shady trees and cactuses together with the blue sky build a beautiful contrast to the 7 white luxury chalets, which are individually furnished. This Western Cape game reserve boasts 26 different species and 800 animals in total on 10 000 hectares in beautiful scenery. More than 12 years of know-how guarantee a perfect Cape Town safari experience. Inverdoorn is unique as it boasts a great variety of species with large family herds. This Western Cape Game Reserve specialises in walking with giraffes. 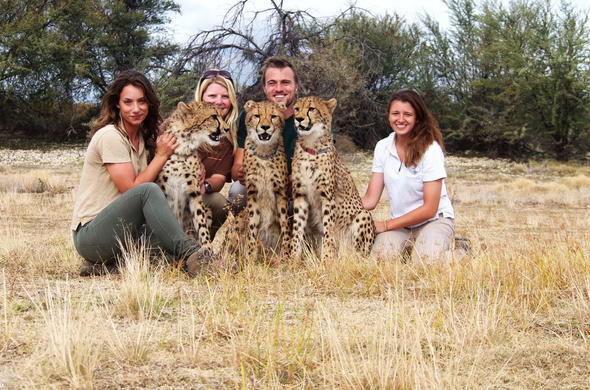 It also offers a cheetah rehabilitation centre where guests will learn about the breeding and special care programmes. The pool area with comfortable couches and swing chairs, the beautiful cactus garden and the boma-like are (outdoor enclosure with fireplace) invite guests at Inverdoorn to relax and chill after their game-viewing experience. Guesthouses for families or groups and conference facilities are also available. Activities like quad biking or visits to rock art can be arranged. Between 1915 and 1972, this land was known as the biggest fruit farm in the southern hemisphere. In 1907 it was reborn as a private nature reserve and protected area for wildlife and biodiversity. Today, Inverdoorn grows most of its vegetables on its own. Experience delectable French cuisine combined with a South African touch. Enjoy the romantic atmosphere in this idyllic setting. Quiet and peaceful Karoo nights offer amazing star gazing opportunities. Very important at Inverdoorn is to keep the balance and harmony between humanity and biodiversity. The passion and the respect for nature are passed on to the visitors.